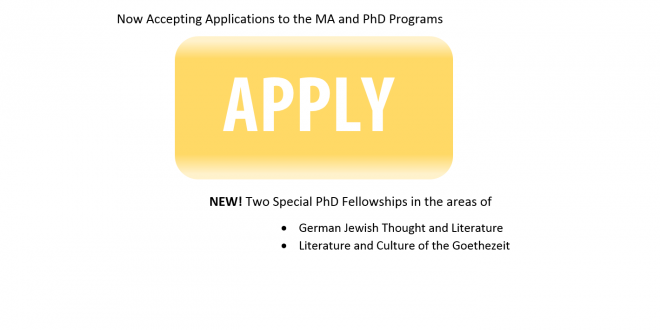 Applications to the Graduate Program in German Literature, Culture and Theory must be submitted through the School of Graduate Studies online application website. The complete application includes the online form, submission of transcripts, two letters of recommendation, a brief resumé and a sample of written work. You are also required to provide a tentative outline of your course of study and your reasons for embarking on graduate study. Please consult the School of Graduate Studies Calendar and the departmental Graduate Handbook for details on eligibility criteria. Additional information may be obtained from our Graduate Handbook and the 2015-16 School of Graduate Studies Admissions Guide. Applications for 2015-16 will be accepted as of September 23, 2014. The deadline for online application and payment of application fee is January 16, 2015. The deadline for receipt of documents is January 31, 2015.